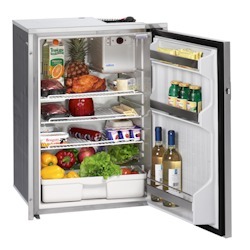 Cruise CR 130 Drink models replace a freezer compartment with extra space for drinks. An innovative built-in condensation system makes each unit virtually frost-free. Total Volume / Capacity: 4.6 cu. ft.
¹ Stainless Steel units are flush mounted. Classic units are proud mounted (door stands out from cabinet face).